Santa Claus for real? There was a St. Nicholas. Unfortunately, we have little sure knowledge about him. According to legend, in the fourth century, in the town of Patara, in the Asian province of Lycia, a childless couple prayed for a son. Their prayers were heard and they named him Nicholas. Even as a baby, he showed marks of holiness. The legend says that young Nicholas sought God earnestly, learned scriptures, fasted often and prayed much. His parents died while he was still a young man, and he inherited their property. From the start he determined to use it for good. He gave assistance secretly, not wishing his good deeds to be seen. For example, when he learned that a local nobleman had fallen on hard times and was contemplating selling his daughters into prostitution, he secretly threw gold into the house to enable the girls to marry and escape degradation. Some versions say he threw the gold down the chimney where it lodged in stockings they had hung up to dry. By such tactics, he rescued many people from moneylenders and provided clothes for the naked. Later he sailed to Palestine to tour the places where Christ had walked. On the way, says the story, Satan raised a great storm, hoping to destroy the ship. Desperate, the sailors cried to Nicholas to pray for them. He did, and the sea immediately became calm. Shortly afterward, one of the sailors slipped while climbing the mast and fell to the deck where he lay dead. In answer to Nicholas' prayers, God restored the seaman to life. After visiting the shrines at Jerusalem, he boarded a ship for Lycia. The Lord had forbidden him to become a hermit as he wished. Plotting evil, the sailors steered in the wrong direction. Nicholas prayed. A storm arose and blew the boat to Lycia. Myra was the chief city of Lycia. Nicholas headed to Myra. About the time of his arrival, the city's bishop died. The church seemed ready to split as its leaders argued who should be the next bishop. At that point, one of the bishops was instructed in a vision to choose the man who came to church earliest in the morning. It so happened that Nicholas was the first to church, for he rose at midnight each night to begin his day of prayer. When questioned, he responded so meekly that the assembled bishops agreed he was God's choice. 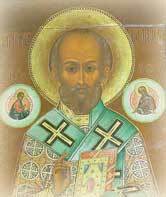 As bishop of Myra, Nicholas resisted tyrants and taught truth, especially rejecting the Arian heresy. His people loved him. Whereas before, he had done his acts of charity anonymously, he now realized that he must act openly, for he must be an example to his people. "The doors of his house were open to all. He was kind and affable to all, to orphans he was a father, to the poor a merciful giver, to the weeping a comforter, to the wronged a helper, and to all a great benefactor." He brought down a local temple of the goddess Diana, confronted unjust rulers, defended individuals who were falsely accused and prayed for relief during famine. Nicholas attended the Council of Nicea, where he was almost stripped of his office because, frustrated with the claims of Arius against Christ, he slapped him. He was required to apologize. After a short illness, Nicholas died on this day, December 6, somewhere between 341 and 352. His body was laid in state in his church. A sweet substance called myrrh is claimed to have flowed from him. In the eleventh century, Italians took his relics to Bari, Italy, supposedly to preserve them from Muslim invaders. That is where they remain. It is claimed that myrrh still oozes from the relics and has a special virtue to heal the sick. In Germany, Switzerland and the Netherlands, gifts are given on Nicholas's day and in the United States, on Christmas day. Russia holds him as a patron saint. In fact, on March 13, 2001 A delegation of the Catholic Archdiocese of Bari, Italy, brought a portion of the relics of St. Nicholas to the Russian Patriarch as a gesture of good will. Butler, Alban. Lives of the Saints. Various editions. Ott, Michael. "St. Nicholas of Myra." Catholic Encyclopedia. New York: Robert Appleton, 1914. Scarola, Shonnie. "St. Nicholas Day." Domestic Church Communications, Ltd. http://www.domestic-church.com/CONTENT.DCC/ 19981101/SAINTS/nicholas.htm. "The Saint Nicholas Page." http://www.geocities.com/Athens/7175/ stnich-page.html. Veith, Gene Edward. "Slappy holiday; Why not take the Santa Claus tradition a little further?" World. (December 24, 2005): p. 22.